Pakistan Tehreek e Insaf is a political party in pakistan and it is biggest political party in pakistan. Its moto is to make presperous pakistan where every person can live with peace and can help the fellow citizens. Founder of tehreek e insaf Imran khan who was cricketer set this goal to give every person jutice and equal rights to everyone. Nowadays in pakistan election is going to be held in july 2018 and for that every political party have given the party tickets to take party in election from their halqa. So PTI also have given the tickets to the candidates of MNA and MPA. There was a time when no one was agree to take ticket from imran khan’s Pti but now a lot of candidates have given application for ticket but all the candidates could not get the tickets. Here is the list of candidates who have ticket of mna & mpa for election 2018 in pakistan. 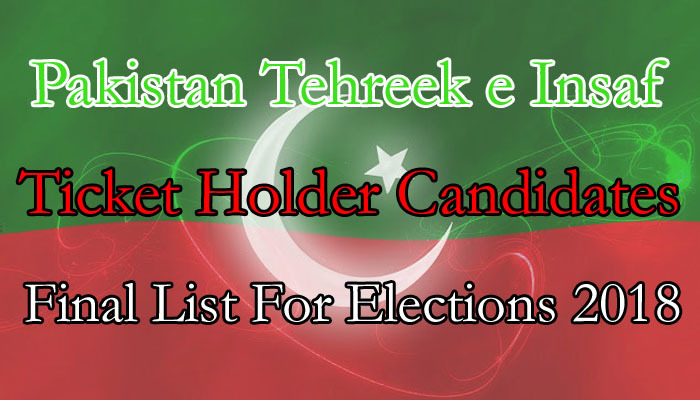 you can check online pti final list of election candidates for mpa mna.